This ginger and garlic baked chicken is by far my best baked chicken recipe ever! This is juicy chicken with best flavors! When you are looking for an option of tasty as well as healthy meal, then nothing fits your bill better than this ginger and garlic baked chicken! You can devour this delicacy guilt-free to your heart content and your mind and soul would be grateful to you too! 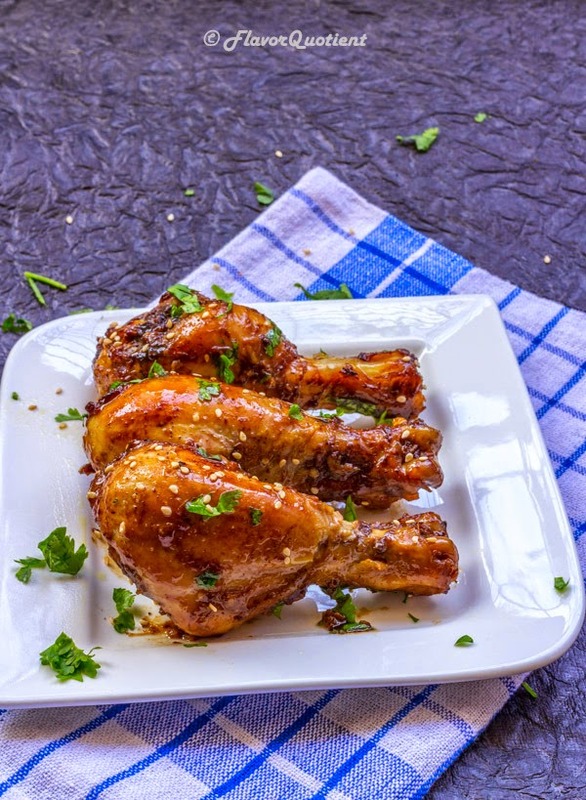 The flavors of ginger and garlic infuse the chicken drumsticks so beautifully that you won’t be able to keep your hand off this yummy ginger and garlic baked chicken! Baked chicken is my favorite technique of cooking chicken these days. Yes, it requires some additional marinating time so that the meat can soak up the flavors, but that’s the beauty of it and rest of the work is done by your oven. This recipe of ginger and garlic baked chicken is also quite an easy recipe with just a few minutes of prep work and then you can simply shut it in your oven! I used skinless drumsticks for making my ginger and garlic baked chicken as getting rid of the skin will straight away reduce the fat content. But if you are okay with that, you can use the drumsticks with skin-on for a more tender texture of the meat. Skin helps to retain the moisture inside the meat while the dry heat of the oven cooks it. 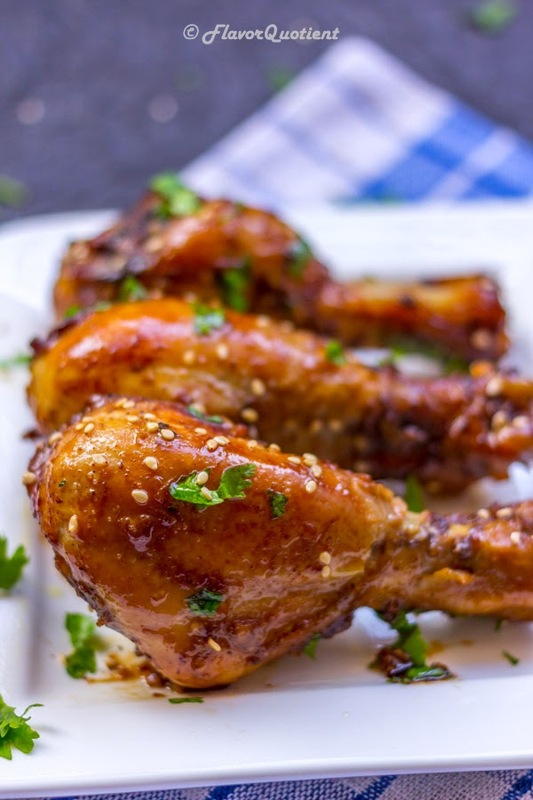 This ginger and garlic baked chicken will definitely taste better if you use skin-on drumsticks. 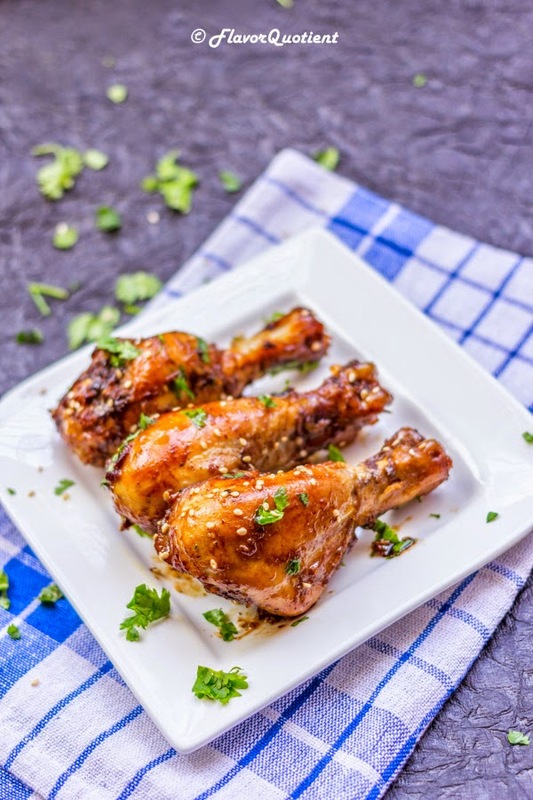 Whatever you use, skinless or skin-on, trust me, you will not want to leave even a tiny bit of this ginger and garlic baked chicken; this is so powerfully delish! I loved the sticky sweet and spicy dripping sauce which is the heart of this dish and just takes minute to prep up! Happing baking! Add the ginger and garlic to the chicken and gently rub them on the chicken. Mix all the remaining ingredients in a bowl to prepare the marinade. 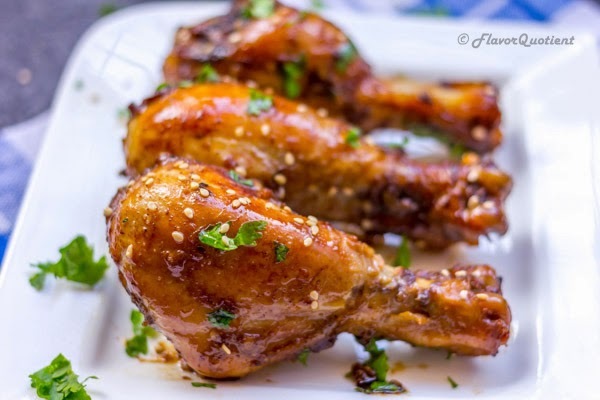 Rub this marinade onto the drumsticks to coat them evenly all over. Keep in the refrigerator to marinate for 30 minutes. Line a baking tray with aluminum foil (this will make the clean-up way too easy) and brush or spray oil over it. Line the chicken on the prepared tray making sure not to crowd them too tightly. Place it on the middle rack of the oven and bake for 40-45 minutes, or until the surface turns golden brown and charred.